"CLEARANCE" – From time to time goods may have been over purchased and retail trade partners were unable to take the extra inventory for their promotion/s; a special deal was organised with suppliers but the quantity was not enough to distribute through retailer channels; the retailer may have returned stock that hasn’t sold through in a set period of time (called stock rotation). Such stock may have retailer security tape or markings still on the packaging for example and perhaps some slight soiling and/or marks on the packaging; the major proportion of goods have been unused and unopened, however some may have minor blemishes on the actual product even though the utmost of care has been taken during processing and return from our factories. With a big 10" display area, this elegant borderless photo frame can show off your latest holiday pics or use it as a work/productivity tool. Playback picture slide shows from an SD card or flash drive. 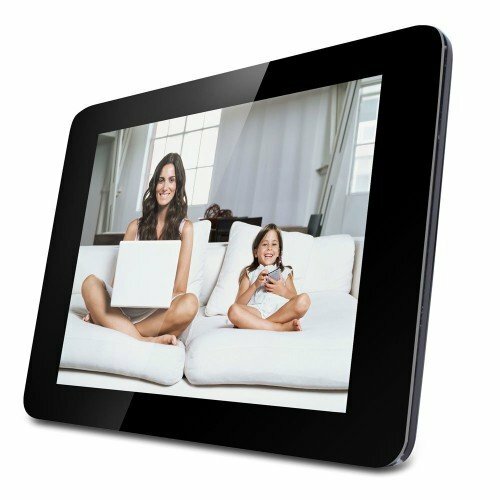 A-Grade LCD panel with super bright images and high contrast ratio.